Salmon has got to be one of the most popular fish to serve for dinner, and my Mediterranean style salmon will certainly be a crowd pleaser! With my easy to make olive tapenade you've got yourself a healthy and delicious restaurant-style dinner. 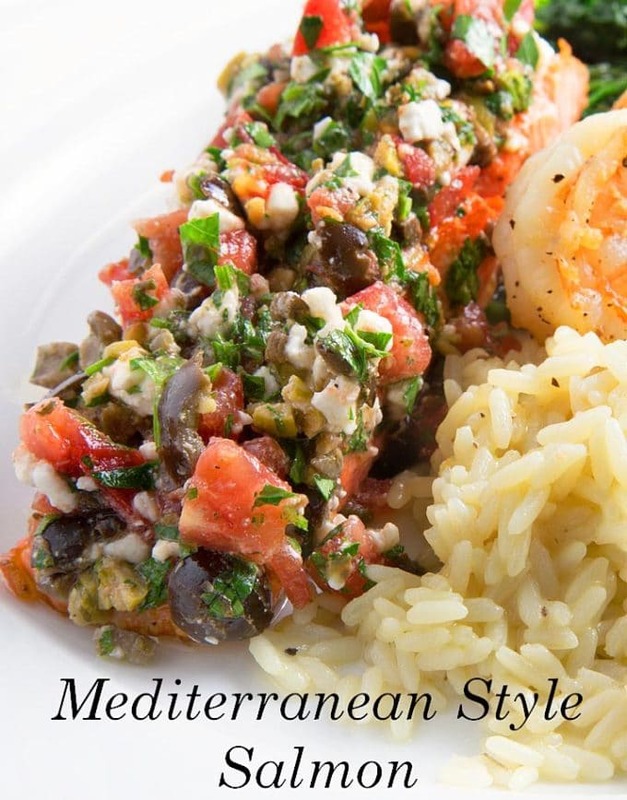 Mediterranean Style Salmon – Delicious and Healthy! 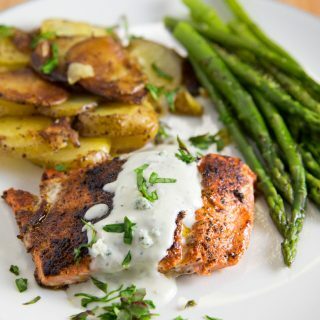 Since finding out that I like salmon (specifically Northwest Salmon) I’ve been enjoying experimenting with different ways to prepare and serve this delightful fish! This is one of my Restaurant Style Dishes that you can make easily in your own home in less time than it takes to pick-up takeout and for a fraction of the cost of eating out……. What could be better? Everyone has busy lives and eating well has to be one of the most important decisions we need to make. 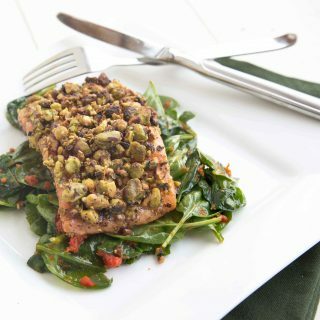 But eating healthy doesn’t mean we need to scrimp on the flavors and my Mediterranean Style Salmon is loaded with flavor. 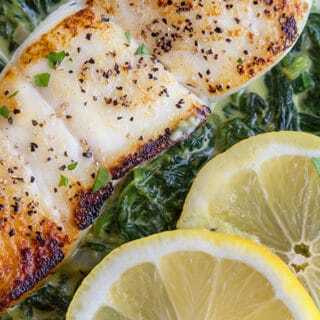 With a busy lifestyle we need to find healthy flavorful dishes that we can make in a short amount time, and of course, we need them to be cost-effective. Since my recent find of Northwest Coho Salmon at Costco, good salmon has become affordable and since its IQF frozen, readily available. You can make the feta-olive tapenade ahead of time to even save yourself, even more, time and do yourself a favor and make a little extra because you’re going to love the flavor of my feta-olive tapenade. 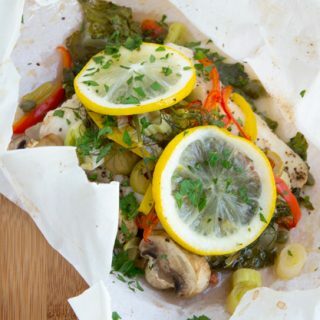 It makes a great bruschetta topping and would be delicious with grilled chicken or any other fish. Serve this dish with your favorite side dish or just a salad and you have a healthy delicious restaurant-style dinner on your table in less than 30 minutes! We loved it! All clean plates st our house. I put the salmon with the tapenade on back in the oven a few minutes to give a tiny melt to the feta, as I have another recipe that roasts the olives and tomatoes before serving. Also used a touch of white wine instead of water when baking the salmon. Thank you chef Dennis!!! We will be back to try more if your wonderful recipes. I am thrilled to hear that you enjoyed my recipe! 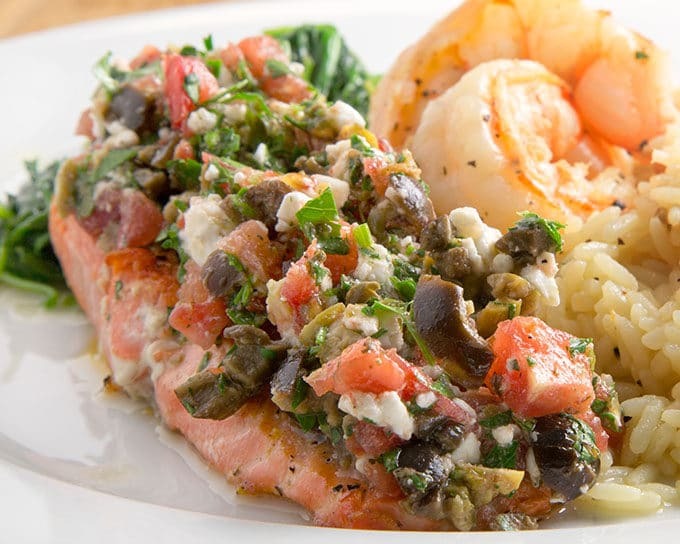 It’s a delicious way to enjoy salmon for sure! I hope you get to enjoy more of my delicious recipes! I have made this at least half a dozen times since finding this recipe back in May and I just have to give you props! This is the most delicious salmon recipe I’ve ever tried. It’s even better cold the next day. Thank you for posting! thank you so much for letting me know you’ve been enjoying my recipe! Gorgeous looks insisting to try it now. Thanks for sharing. The whole dish looks great – but that feta-olive tapenade looks amazing – I imagine using it for heaps more!!! Thanks! Just made this for me and my girlfriend. I served it with lemon and rosemary rice and it was delicious. This is the first time I’ve cooked salmon without the skin on and in water in the oven, it came out so good. Finally the tapenade was so good and a perfect compliment to the salmon. I’m very happy to hear that my salmon recipe was a hit at your house! 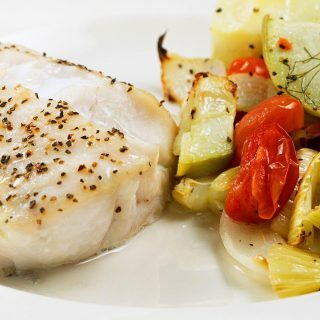 Remember to always add a little water to the pan whenever you oven roast fish, to help it stay moist. Now you have to try my tiramisu recipe and really wow your girlfriend! If only she liked coffee! Anything else that would be a nice follow dessert to this recipe? I made this again tonight but used sun dried tomato rice and did cajun season king prawns with it…..delicious! Easily my favourite recipe I’ve found this year. Thanks chef Dennis! A strawberry gelato or lemon gelato would be a good choice. I am planning on using this delicious-looking recipe for my New Year’s Eve party but I do have a question. Do you usually heat up the tapenade or is it served cold/room temperature? Thanks!! I thought about heating it up but ended up serving at room temp. I think that was definitely the way to go, I think heating it would make the flavor profile too intense. Outstanding recipe! I changed the Salmon a little to bake in foil (olive oil/lemon juice), but made the tapenade exactly. One of the best Samon dishes I’ve tried on my own. High marks from my fiancée. Thanks for this! 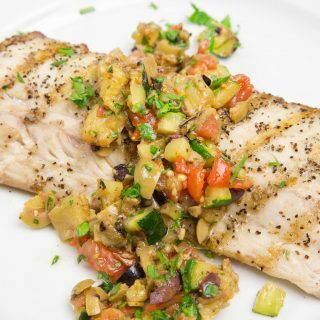 I’m very happy to hear you enjoyed my recipe John, the tapenade is an excellent way to enjoy salmon! Hi Chef Dennis! I love your recipes! This salmon looks fantastic. I have salmon in the freezer, so this is dinner tonight! Thank you for such simple yet awesome recipes! Happy to hear you enjoyed the recipe Rachel! I see your response that you do not post calories, but just another comment on that; if recipes are listed under “healthy” it would be helpful to know nutritional information, not just calories. There are many people out here these days with different types of diet restrictions who need to know that information. There are programs like Mastercook that calculate that, and that you could use to find that information. It’s a nuisance to put all of a recipe in, and then discover that it does not fall within restrictions you might have. I would suggest anyone on that type of diet, use one of those programs for all of their meals before cooking. I’m on a low calorie , GF, Soy Free diet myself and pretty much use common sense. If you’re on a restricted diet having that program to input all your meals is something each individual should do. Most cookbooks and magazine recipes don’t include nutritional information. Can I order your cook book? I don’t have a cookbook Modi, but thank you for asking. Please post calories for your wonderful healthy recipes. I need to know! Thank you. Sorry Alberta, but I don’t figure out calories of my recipes or supply any nutritional info, just the recipe I use to make my dishes. Dennis, I always have salmon in the freezer — plus tapenade is a favorite o’mine. Genius flavor combo… you ROCK!!! Hi Chef Dennis. This is just so mouthwatering. Definitely perfect to eat with rice. I love salmon. It looks so amazing! Thanks Maureen, I’m happy to hear you like my Salmon! Yum – thanks so much and Have Easter to you! your welcome Liz, Happy Easter to you as well! I am a big fan of salmon, the recipe sounds so delicious. Thank you bunches for sharing. I love tapenade Lindy and its a nice addition to salmon, hope you enjoy it! Mouthwatering Chef, that’s great stuff. I love the look of the rice you have served it with. Bookmarked, again. Thanks Larry, it was pretty awesome!